I’ve made a few passing comments in recent weeks about New Zealand universities, mostly in the context of discussions and debates around immigration. Export education is one of the key emphases of the current government’s economic strategy; they and their MBIE advisers appear to believe that somehow we boost the incomes of New Zealanders by making it relative easy for people who come to study here to gain residence. I’ve been a bit skeptical about this argument. If there are economic benefits to New Zealanders from immigration to New Zealand, they probably arise mostly if we are able to attract particularly high-skilled, able and innovative people. In a US context, people often talk of the benefits of having a top tier university system, which attracts top-flight students to do PhDs in the US and can help encourage some of those people to settle in the US, with possible spillover benefits to the wider economy. It all sounds good in principle, and there is some evidence of those sorts of gains for the United States. But what about New Zealand? 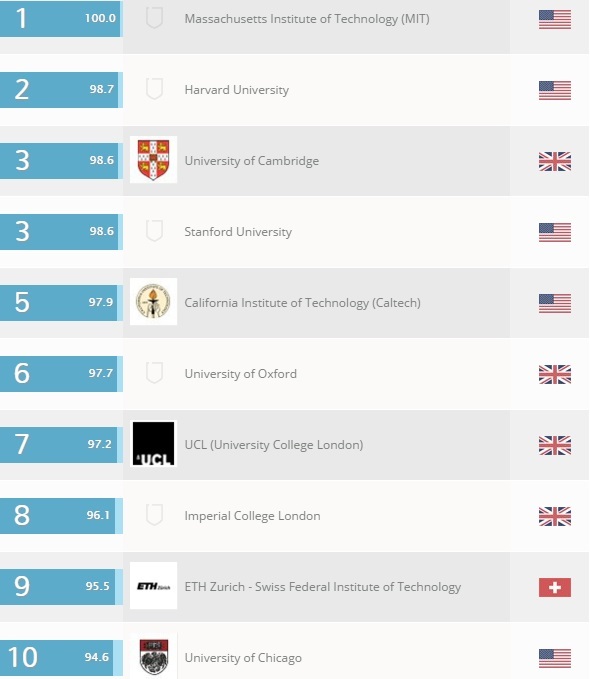 Well, I noticed that one set of international rankings of universities (the QS rankings) had been released earlier this month, and I started digging round in their data. There are a number of different rankings systems, and they all produce slightly different results, emphasizing slightly different things. New Zealand universities just aren’t in the same league as these sorts of places. But how do our universities compare with those of other small advanced economies? I painstakingly went through both the QS ranking and the Times Higher Education rankings for New Zealand and all the smaller OECD and EU countries, plus Singapore. “Small” in this context meant fewer than 11 million people (Greece, Belgium and the Czech Republic are all just below that population). There is quite a gap to the next smallest country, the Netherlands, with almost 17 million people. New Zealand’s population is around that of the median country. I took the average ranking for each of the universities in each of these countries, for both the QS and Times rankings. Across the two sets of rankings, New Zealand’s universities turn out to be right on the median among these small advanced economies. The really lowly ranked systems are those of the former Eastern bloc Communist countries (notably Bulgaria, Croatia, Hungary, Latvia, Lithuania and Slovakia). But New Zealand’s economic performance is also less impressive than most of these advanced economies. There is a reasonable correlation between the two. 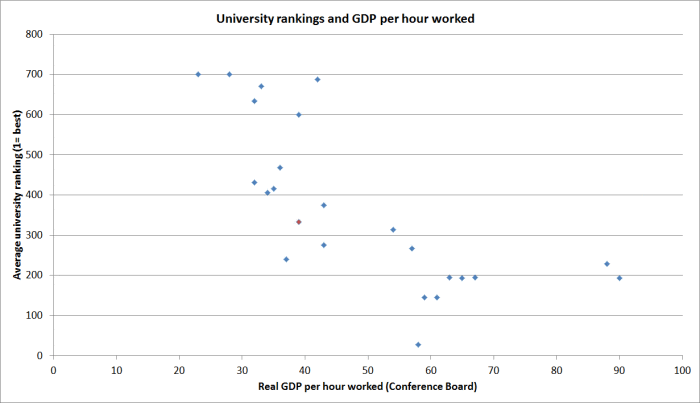 Here I’ve shown the average university ranking for each of these small advanced countries against real GDP per hour worked for 2014, taken from the Conference Board’s database. New Zealand is highlighted in red. New Zealand doesn’t seem to do too badly, but we don’t stand out. (The outliers on the right are Luxembourg and Norway). If we don’t stand out, it is a little hard to see why top-tier foreign students would be keen to come and do PhD (and subsequent post-doc) study in New Zealand. We will always attract some people – and being an English language country helps us attract more foreign students than one might expect given our size and distance – but not many of them will be from the top tier of potential students. It is those top tier students from whom the strongest contributions are later made – and usually only from a relative handful of them. And for almost all of those people, the top universities in the US or the UK (and a handful of others, in Switzerland, Singapore, or perhaps even Australia) will overwhelmingly be the destination of choice. Perhaps for some these sorts of numbers suggest a strategy: “lets make our universities great, and then we’ll attract top tier students, who in turn might stay and help lift New Zealand’s economic performance”. I suspect that if there are any causal relationships here, they are mostly the other way round. Top universities are as much consumption goods as production ones, and luxury products tend to be found in the richest and most successful countries. The United Kingdom and the United States have long been the richest and most successful countries and they have university systems that reflect that (the UK isn’t that large a country but has around 15 universities in the top 100). Among the smaller countries, Switzerland and the Netherlands have also long been among the most prosperous countries, and also stand out with relatively high-performing universities. No doubt, causation runs both ways – top universities are a magnet for talent and in some cases that talent can be part of the process of innovation and economic advancement – but it seems most unlikely that one can first create the top tier university and then see the prosperity follow. That is perhaps especially so in somewhere as small and remote as New Zealand. What would make top tier foreign academics, in large numbers, want to come and stay in New Zealand? Perhaps money might do it for some, but even if governments were to make the money available, backing this as some new “growth strategy”, I rather doubt it could be a sustainable strategy. Distance is simply too formidable an obstacle. As I was playing around with this material, I was thinking of the New Zealanders who had worked at the Reserve Bank in my time there who had gained PhDs. A few have pursued them at New Zealand universities – several are at present – because it enables part-time study and fits with family commitments etc. But I jotted down a list of 14 people I could recall who had done PhDs overseas, mostly after leaving the Bank. Most went to the US or UK, and all of those went to top tier universities (LSE, Cambridge, Berkeley, Stanford, Chicago, Yale, Princeton, Harvard, NYU). Even the two who did PhD study in Australia did so at universities rated materially higher (overall, and in economics) than any of New Zealand’s universities. These were all very able people, and the revealed preference in their choices suggests that universities of the quality of those in New Zealand (middling by international standards) are most unlikely ever to attract any material number of the sort of exceptionally talented creative people from abroad around whom one might reasonable begin to build an immigration policy. PhDs aren’t everything, and lots of highly creative people have no interest in that particular sort of field of endeavor, but it just helps illustrate the point about how difficult it is more generally for a small remote country, with mediocre incomes, to attract the world’s best. In my view, we are much better focusing on building a prosperous and successful society around our own people, as capable and hardworking as any in the world. If we can attract these sorts of people, New Zealanders might well benefit. We probably wouldn’t get many, but who knows. And large numbers aren’t really the path to prosperity; mass moderately-skilled migration hasn’t been any sort of successful economic lever in New Zealand in the last 25 (or 70 ) years. University rankings are a strange and complex sociological phenomenon indeed. As far as I can make out, they are based largely on more or less objective criterion of annual budget plus a highly subjective criterion of “prestige”. Universities in N.Z. are rather low on the scale of “prestige”, and very unremarkable on the scale of annual budget, compared with universities in countries with much bigger economies. I guess that the somewhat simplistic and idealistic assumption is that bigger budgets attract “higher quality” (by some subjective and/or objective measure) academic staff which translates to better quality of teaching and research. But the key point, at least for N.Z. universities, is that attracting more and more overseas students, all paying fees and contributing generally to the N.Z. economy (e.g. they have to live somewhere and buy food, etc.) is a revenue boost for both the university and the country. I have heard it said. by people who should know, that overseas students do take notice of international rankings when choosing a university, so the higher the ranking, the more overseas students. The effect of just a small increase in rank is not likely to be huge, of course, but may still be significant, or so universities here seem to think. Hence, a great deal of effort is put into trying to achieve even very modest rank increases, so as to try to attract more overseas students, so as to boost revenue. But none of this has very much to do with attracting “talented” people to N.Z., unless talent is measured by the thickness of one’s wallet! Hello Michael – I spent a decade working in “Export Education” from ’97 to 07 as it went through a boom and (mini) bust. There was comparatively little data then as to what the drivers of Export Education were. At the beginning there were no extra incentives of an NZ degree to get PR. Cost, perceived safety of NZ (there were some “incidents” that had a negative impact on the Chinese market), and educational reputation were drivers. Also, the availability of tertiary places in the students’ home countries. In the early days the arguments for Export education were around “it is good for trade” – ie NZ students would benefit from the presence of foreign students building understanding and linkages, and returning foreign students would benefit NZ. There was plenty of anecdotal evidence for this (starting with the Colombo plan students – even recently I read one of the new Myanmar Vice Presidents very recently spent several years in NZ while his wife completed a PhD). Only later was the idea put forward that NZ educated students would make “better” immigrants than non-NZ educated. The logic was simply that they would integrate better. The reality was that they had a harder time getting jobs than their Kiwi peers. On another point, I don’t think that immigration’s point system distinguishes between universities on the basis of any ranking system. THanks John. Interesting perspectives. I guess there is also a bit of an issue in translating from the Colombo plan type of experience to today – people coming in the 1960s would have been among the very best of the home country students, which probably isn’t the case today (since most of the growth in export education is PTEs not universities anyway).